Unique and well-constructed, this horror documentary is one of the most entertaining of its genre. 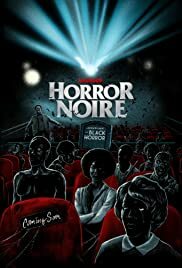 Filled to the brim with fascinating talking-head interviews from a variety of compelling speakers, director Xavier Burgin's valentine to black horror is informative and captivating for horror fans, but I suspect it's even more compelling for black audiences. It's the type of affirming look at a relatively narrow topic that manages to expand beyond its original scope, and makes several salient points about social justice, American history, and most importantly, the role that black people play (willingly or otherwise) in those intersections. Most impressively however, the movie's best feature is its aforementioned interviews, with a terrifically selected representative body of speakers that includes actors, filmmakers, and educators, in particular Tananarive Due and Ashlee Blackwell, who effortlessly provide context and insight for a variety of aspects related to the movie's topic. It's a great way for horror fans to spend 90 minutes, and there's a lot to appreciate for film historians as well.